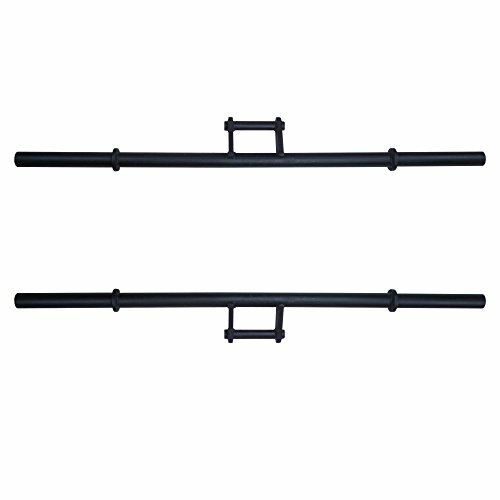 With these Farmers Walk Handles by Titan, you can attain an advanced free weight workout with minimal equipment clutter. - Sold in pairs, so you'll be able to get started immediately. - Farmer's Walk Handles work your grip strength, upper back, and endurance. - Loadable with bumper or steel Olympic plates. - 12" of loadable sleeve space on each side. - Loadable sleeve length: 12"
Sold in pairs, so you'll be able to get started immediately. Farmer's Walk Handles work your grip strength, upper back, and endurance. Loadable with bumper or steel Olympic plates. 12" of loadable sleeve space on each side. - Weight: 20 lb each - Overall length: 60" - Loadable sleeve length: 12" - Diameter: 1.955" - Handle length: 5.5" - Handle diameter: 1.25"